Today, I’m playing along with a favourite challenge, the Color Throwdown, and the fabulous combo is slate blue, orange, brown and white. 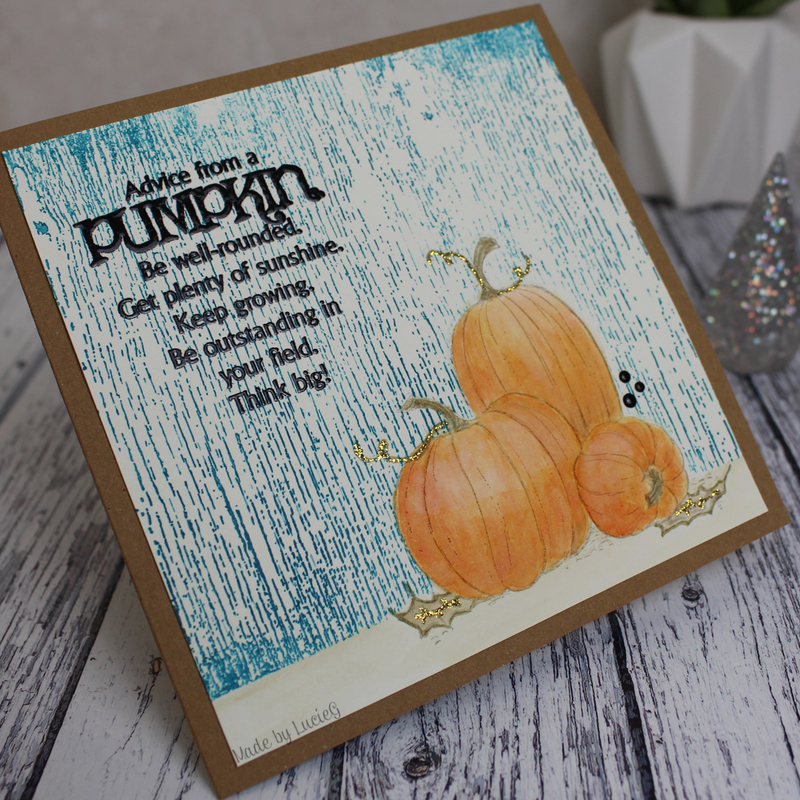 As soon as I saw the colour combo, I knew I wanted to create a distress ink panel with the gorgeous slate blue (stormy sky) and I decided to create an autumn card around that. The card came together very quickly – I added a Penny Black tree and lifted off the blue distress ink from the image before colouring it with my Twinkling H2O paints. To finish off the card, I added a sentiment by Hero Arts. I can’t believe it’s November, can you? Lots of fun challenges on social media this month and I’m hoping to play along with two of them – Kathy Racoosin’s The Daily Marker 30 Day Challenge and Tracey McNeeley’s 25 Tags of Christmas. So, onto my colouring for Day 1 of the Daily Marker challenge. I inked up Newton’s Pumpkin Patch and got to work with my twinkling H2o paints. Can you see the shimmer? I wanted to include my mum’s two cats – Oscar (white and red) was easy enough but Minnie (ginger) was quite a challenge as I had already used a lot of orange for the pumpkins! You know, I have far too many Halloween supplies…. dies, stamps, embellishments…. and they are so much fun to play with! So, I banned myself from buying new Halloween supplies this year. Well, that came to an abrupt end when I saw Picket Fence Studio’s ‘Wicked Together’ set. Such fun images and sentiments… I HAD to have it! For this CAS one layer card, I used my favourite two stamps from the set. I masked off a circle and blended some bright distress inks. I then fiddled with the sentiment FOR AGES until I got a positioning that I was vaguely happy with! Thank goodness for my MISTI, here! Finally I stamped the fun cat in the circle and while I was tempted to add some glitter or bling, I decided that less could be more this time! I’m entering this into the Simon Says Stamp Monday challenge – take flight. The theme for the October Memory Box challenge is Halloween or candy. 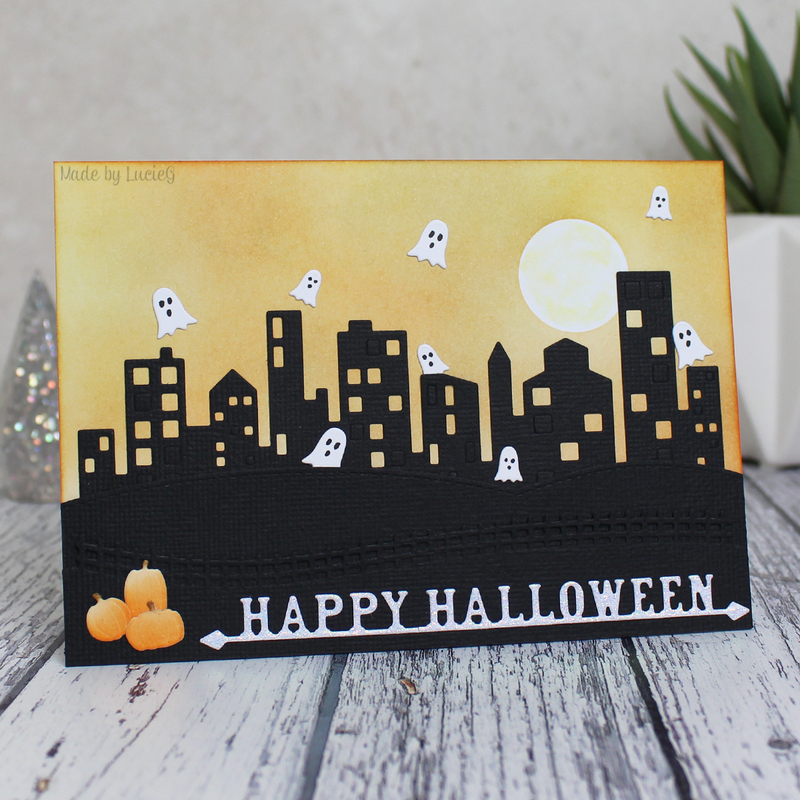 This was very tricky for me as I have a ton of Halloween dies by Poppystamps but very few by Memory Box, so I knew my entry would need some out of the box thinking! 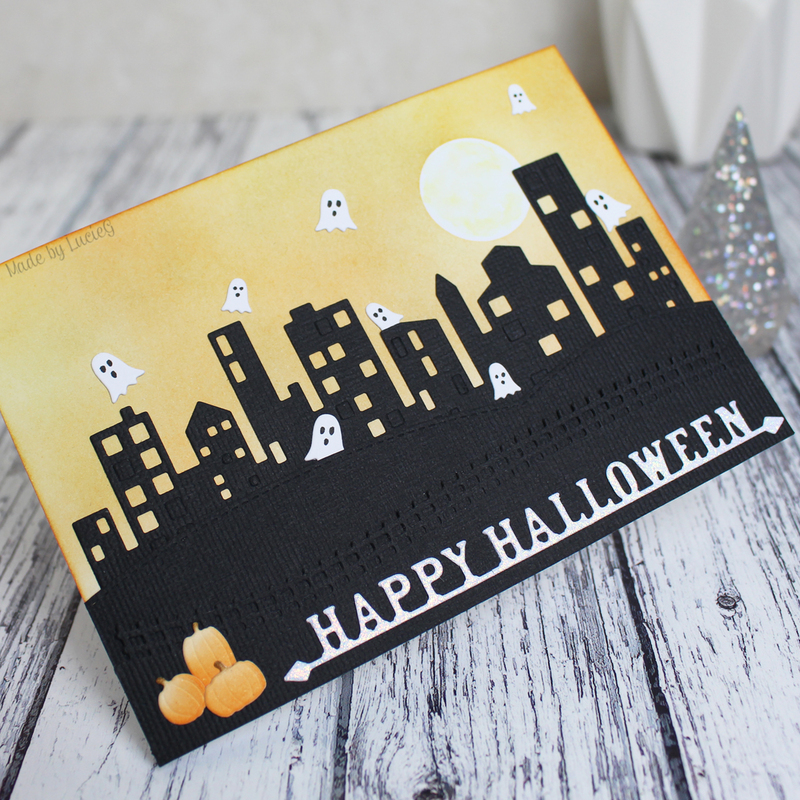 In the end, I decided to use the Cityscape Nightline die to create a city Halloween scene. After cutting the skyline, I added a slope and fence cut using dies from the Wide Open Spaces set. I adhered the dies cuts to a background I created from yellow/orange distress inks. I’ve been making a lot of purple cards recently so wanted to do something quite different this time! The next challenge was the ghosts. I don’t have any small ghost dies…. So I repurposed the Bitty Blooms set and added eyes/mouths to the upturned blooms! To finish off the card, I added a few die cut pumpkins from the older Perfect Pumpkins set and added a Poppystamps sentiment to finish off the card. This week’s colour palette over at the Color Throwdown challenge is very me – rust, dark teal and cream! It also feels quite autumnal so I decided to ink up my Penny Black pumpkins stamp again. I only ever seem to use it at this time of year (here’s how I used it last year) which is a shame because it is so fun to colour. 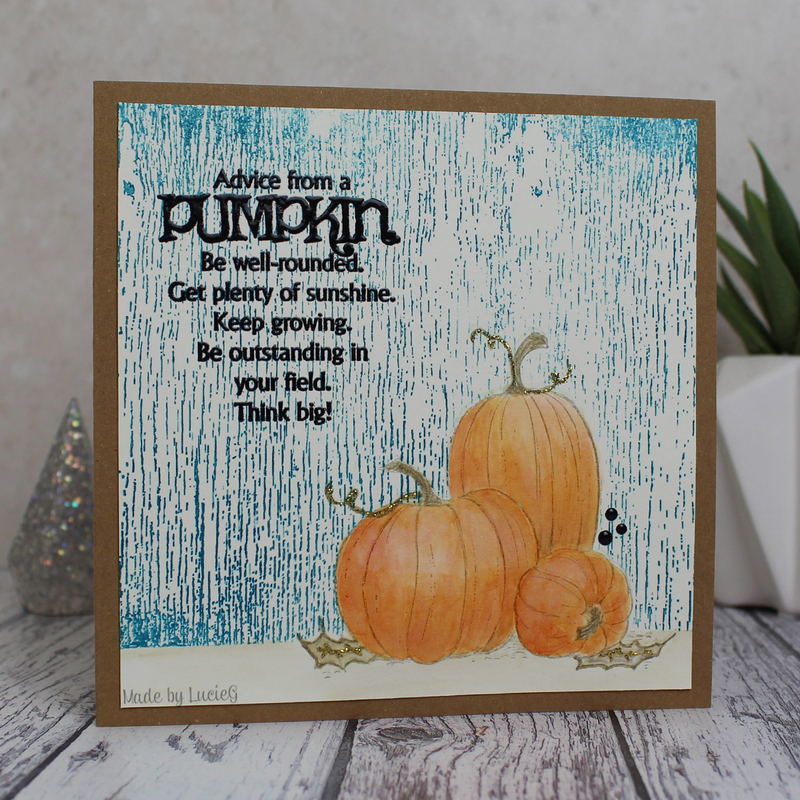 I coloured the pumpkins using distress ink (rusty hinge and fired brink) and then masked them off before I stamped an Impression Obsession background stamp using Stazon teal ink. I embossed a sentiment from Riley and Co and finished off the card with a few Nuvo drops and some stickles! I’m also entering this into the Penny Black holiday challenge. Just popping in with a quick card that I made for the October Poppystamps challenge where the theme is ‘falling leaves and scary things’. I chose the latter – although the cute batty feline doesn’t actually look too scary, does he?! After stamping, cutting and colouring the images, I adhered them onto my new Benedetti frame. Isn’t it a gorgeous die? I LOVE art deco and just had to have it as soon as I saw it… well I really wanted most of the new Art Deco release, but had to exercise some self-restraint!